It was promised over a year ago for my PICSWR project. It has not yet been operated with PICSWR ... but PICSWR's calibration software is intended to working with any SWR bridge. 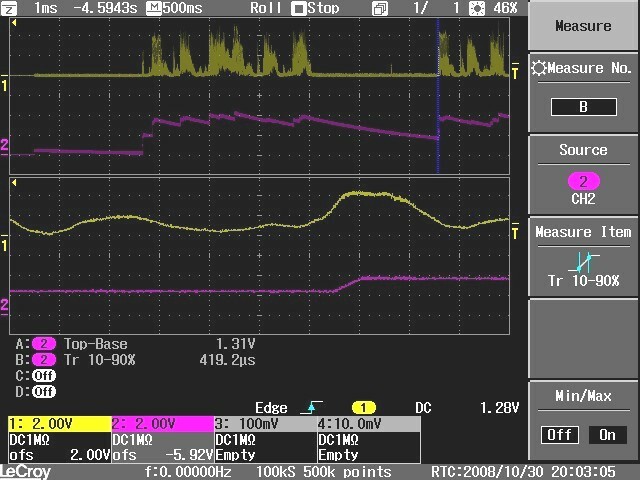 The purple trace suggests an output rise time in the order of 15ms. This works ok simply because most speech bursts are longer than 15mS ... but its not perhaps ideal. Thus the maximum charging current is 10mA. 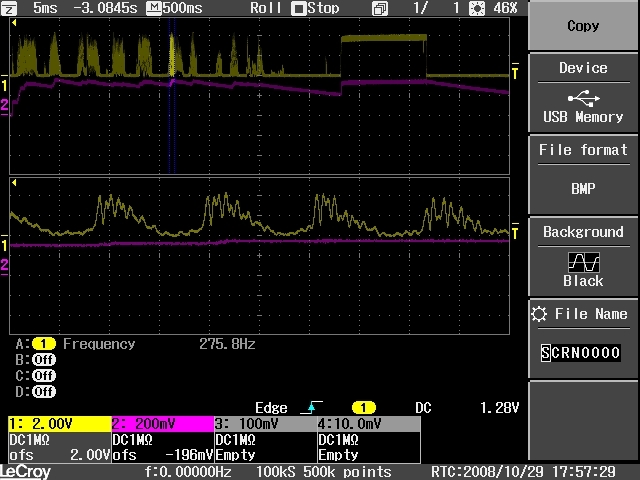 BUT .. as can be seen from the expanded waveform on the scope tracing, the input to the op-amp is not a constant level. It is in fact varying with the speech waveform. I am not sure what the average is but is probably 10% or less and explains the observed longer rise time. Changing this to 2M2 and 1uF would maintain the 2 second decay but the smaller capacitor would reduce the output the rise time by 4x. The time constant between bridge and amplifer is 300uS. Making this longer would help a bit. However, the 300uS design was based on maximum modulation frequency of 3kHz. A significant increase in this time constant would ? impair peak response. The source of charging current is the RF bridge circuit and I dont know how to calculate this. The capacitor choice (C3+C18 and C2+C17) was influenced by the need for RF filtering. At 2MHz, the total of 5nF has an impedance of 18R ... which is not particularly impressive RF decoupling .... hence the use of a series 1mH RFC (12k at 2MHz) with the 5uF shunt capacitance split 3n3 and 2n2 before and after the RFC to make a low pass filter. Note that there is a 100nF output decoupling capacitor (and another 100nF on the input to the AVR processor). Even if the (C22+C9+C8) is reduced to 1uF, the charging of this capacitance (0.2uF) is five times faster than the 1uF and so should not limit the achieve rise time. The speech bursts are much longer than 1.6mS and so a close approximation to PEP should be obtained. Output observed on a 1mA meter - looks good!